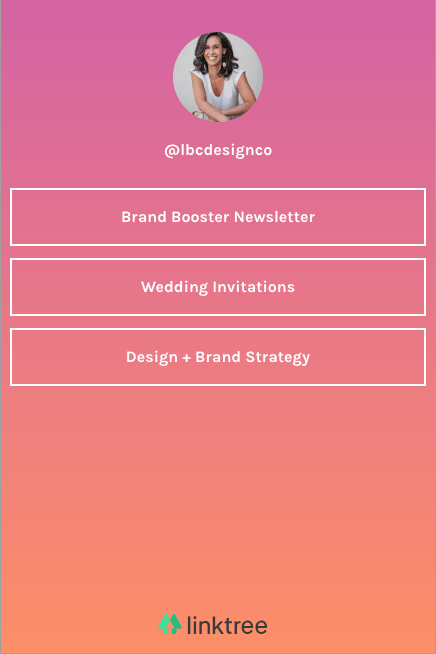 Brand Booster Newsetter — LBC Design Co. I don't know about you, but I'm shocked at how busy January was and that it's already over! I worked with a friend to hash out my goals for the year and am focused on taking more control over growing my business. One of the changes is where and how I promote my services. This month's Brand Booster Tip is in-line with this goal. ARE YOU USING A LINK SERVICE TO CONNECT PEOPLE FROM INSTAGRAM TO YOUR WEBSITE? I often recommend my clients use a link service/system to get prospective clients from Instagram to their website. Well, I used to. The issue is that the free version of these services (linktr.ee, linkin.bio, etc.) don't match your brand and for most of us, the paid version doesn't feel like a good use of our marketing dollars. They also don't take your prospects directly from Instagram to your website and you might be missing some tracking/analytics with Google because you're using a third party to connect people from your Instagram account to your website. I recently switched to an easy to implement (I think) insta-links page that's on brand! I recently saw a photo-based layout. I imagine using the image based style if you’re introducing a new physical product. First, if you aren't familiar with what I'm talking about here's the lowdown. Instagram only allows you one URL link in your profile. This means that when you include a call to action in a post or story you can only send them to one place on your website at a time. So if you post on Monday about your wedding styling service and your Thursday post is about renting wedding furniture you might want to change the website link in your profile each time you post about a different service to help visitors go directly to the most relevant place on your website. Why would you do this? So you don't waste their time or avoid your bounce rate increasing because they think they're in the wrong spot. Or think about it this way, the algorithm is ever evolving. Your post may not always populate in your followers feed on the day you post it. Therefore, if you post regularly enough you could be changing your link in profile before an interested follower sees your post about styling. Since one of the key elements of using social media for your business is to build trust with prospective clients you want to immediately direct them to the part of your website that relates to their needs. Otherwise, they could lose interest before they get to the content they are interested in and leave your website. Some clever techy folks built programs to help us bridge the gap. They are a helpful tool and provide a list of your recent content links. They use their link page to direct guests to your content list. Good, but why not link them directly to YOUR website where your branding is all set and you can personalize the background, links and images. to your opt-in, wedding portfolio, headshot portfolio, or editing service. You then get to build a more direct connection with visitors. They see more of the vibe of you and your business. It’s a simple change that reinforces your brand with the customer. Here’s a look at my before and after! Problem solved, right?! But, how do you make a link platform on your website? Here's are a few easy steps to creating your own, on brand, link in profile page for your website. Create a new page on your website. I named my /insta-links. Create buttons or images (if you want to get fancy) with your brand colors and fonts using your web platform (Squarespace or WordPress), design software, or Canva. Add the button images to your new Insta-links page in the order you want them to appear. Consider putting the most recent, seasonal and always active (like your opt-in) at the top. Link each button to the page on your site where your visitors can get the information/product that brought them to your website. Keep the headings as obvious and short as possible. Share a little bit about you and your business so newcomers can get to know you better. Thanks for giving me a few minutes and the opportunity to share the Instagram link page tip with you! I hope you found this information valuable in building on your current branding and how you connect with your customers. Interested in creating an insta-link page for your site, but don't have the time or just want some help? I'm here for you! I can set up your new insta-links page and walk you through keeping it up to date. Click here to get started now. One of my favorite things is sharing branding information that will help small businesses refine their brand. Each month I share branding tips for small businesses. I never want you to feel like I'm invading your inbox. I want to add value to your brand in manageable chunks and share information that helps you grow your brand. Sign up for the Brand Booster Newsletter so you don’t miss next month’s tip. I have wanted to share branding tips with you all year but had some anxiety about putting myself out there. I have a pile of ideas. Instead for sharing them with you I wasted time over thinking it and stopped myself from moving forward. Maybe some of you can relate? This morning I listened to Whitney English talk about goals and specifically all the things that stop us from reaching them. You can check it out here. Needless to say, it motivated me to share this initial branding tip with you and to ask you to subscribe to my new monthly newsletter, the BRAND BOOSTER. I never want you to feel like I'm invading your inbox. I want to add value to your brand in manageable chunks and share information that helps you grow your brand. You can signup here. I recently read articles about email signatures and what works best. These are quick and easy ways to implement brand best practices with every email communication. The first one surprised me the most because I haven't seen people using it. Include a photo of yourself. It builds trust and a personal connection. Tell them what you do, include your business name and an understandable job title. Owner/CEO doesn't mean anything to prospects or publications. If you are a jewelry maker come up with the smart job title that describes what you do. Include a Call To Action (only one). The easiest thing is asking them to follow you on social media, but if you want to add people to your email list or have a relevant download that's good too. This one surprised me…be sure to include "sent from my iPhone". Research shows that recipients are more forgiving of spelling and grammatical errors if they know you sent your message using a small phone keyboard. I'm a huge Grammarly fan, and they have a mobile app. Another surprise, email signatures that use some form of "thank you" get 36% more responses than closings like cheers, best or kindly. I'm making this change! Check out my updated signature example below. You're likely already doing some of the things listed above. Increase your brand consistency by bringing it all together with your brand colors. Make it easy on yourself, use the HoneyBook or Hubspot email signature generator to create a strong, branded email signature for your business. Interested in receiving more branding tips next month? Be sure to signup for the Brand Booster Newsletter before you start updating your email signature.